Authors: Daniel J. Mortlock et al. In previous astrobites, we’ve taken a look at the role luminous black holes must have played in ionizing the universe soon after the formation of the first galaxies. Understanding when and how the universe become fully ionized after the cosmic dark ages allows us to understand the nature of galaxy formation, particularly in the hard to study epoch shortly after the big bang. Today, we’ll be discussing a new paper, published in Nature, on the highest redshift spectroscopically confirmed luminous quasar yet detected. This new finding challenges existing theories of structure formation in the early universe and provides insight into the nature of intergalactic space early in the epoch of galaxy formation. 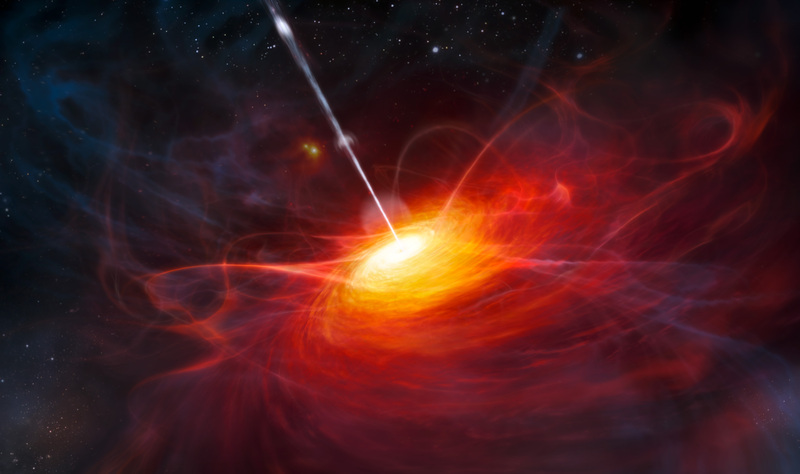 An artists rendition of the high redshift quasar ULAS J1120+0641 (credit: ESO). Quasars are identified via their distinctive spectra, featuring characteristic broad emission lines, blue continuum emission falling off as a powerlaw towards red wavelengths, and a very bright Lyman-α line that can be used to pick out the object and identify its redshift. This particular object was identified photometrically in the United Kingdom Infrared Telescope (UKIRT) Infrared Deep Sky Survey as a z-band dropout. The z-band is well into the infrared, and an object that is dim blueward of z-band but bright in Y-band (redward of z-band) is consistent with an object in which Lyman-α has been redshifted to one micron or so – approximately redshift seven. 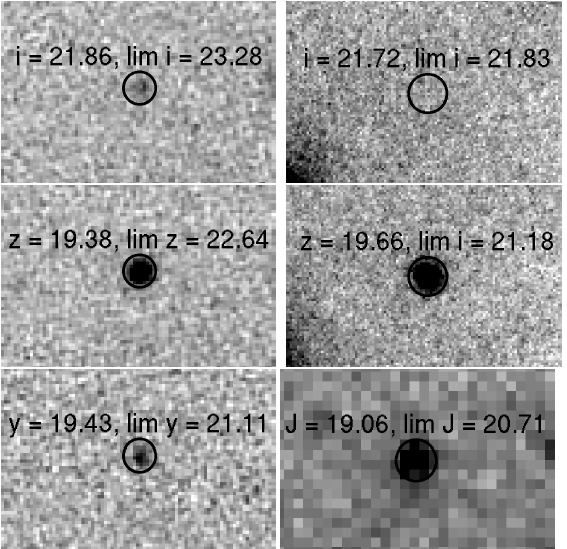 Spectroscopic followup by the Gemini North telescope confirmed the object as a quasar at z = 7.085, the highest redshift quasar yet published in the literature. Obviously, this warranted even more careful spectroscopic followup. A composite spectrum from the Gemini North Telescope and the Very Large Telescope (VLT) is presented below. The spectrum of this object is typical of lower redshift quasars in many ways. Note the broad high-excitation emission lines and blue continuum emission. What sets this object apart, however, is the missing flux in the Lyman-α line, consistent with absorption by neutral hydrogen in the neighborhood of the quasar. As quasars are known to carve out a large ionized region, this quasar is special in that gas in the local vicinity of the AGN seems to still be neutral. Indeed, the IGM around this quasar had not yet been reionized! The far ultraviolet (rest frame) spectrum of the quasar ULAS J1120+0641 obtained at the VLT and at the Gemino North telescope. The spectrum is typical of lower redshift quasars except for the almost complete lack of emission blueward of the Lyman-alpha line. The width of the emission lines – associated with what is known as the broad line region of the quasar, thought to be spatially coincident with the accretion disk of the black hole – implies a black hole mass of several billion solar masses. It’s worth noting that this redshift corresponds to a time only 750 million years after the big bang. That a supermassive black hole had managed to accrete so much mass in so little time puts strong constraints on theories for the birth and early growth of supermassive black holes in the time shortly after the big bang.